Their size varies between 126 and 163 centimeters... They originate in the planet and star system Zeta Reticuli,... a median distance of 37 light years away from the Earth. Their spaceships are similar to our beamships, and extremely well equipped, and are very able for space-traveling. The atmosphere of their homeworld is very similar to the Earth atmosphere, thus they can breathe here without great difficulty. They wear close-fitted filter-dress, which offers protection for them in some ways. The Roswell Case is a reality because the UFO crash actually took place there, but this is denied up to the present day and will continue to be denied in the distant future by the American military and Secret Services, as well as by all government agencies, namely with flimsy, changing, stupid, and ridiculous excuses that will only surely testify to the fact that everything actually happened. With the crashed object, it concerned a beamship from the Reticulum systems. 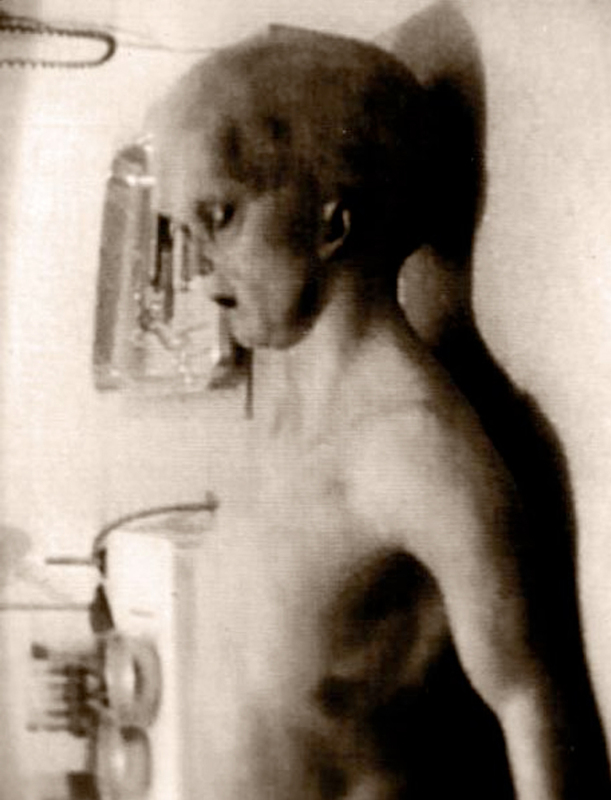 The crew did not consist of natural human life forms but of human androids of a bioorganic nature, which means that they were artificial human androids, which the US-Army also got a hold of, some living and some dead, and these were secretly kept in secret stations [for autopsy, above, below]. With the bioorganic androids, it concerned effective artificial life forms, so not robots or the like, but independently thinking beings, in every way self-capable of making decisions, made out of living material and living organs, bred in accordance with the human beings who are located in the Reticulum systems. In Earth-human terms, these bioorganic androids bred by the Reticulum people are actual life forms, and as such, they are respected by the Reticulum people and are also appreciated and treated, for the androids are, indeed, artificial human beings. As such, they stand under the command of the real humans of the Reticulum systems, on whose behalf they also carry out excursions, etc. to foreign star systems and planetary systems. And such artificial human forms were associated with the crash, as I already explained. The bioorganic androids of the Reticulum people contain an authoritative programming in their artificial consciousness, which prevents that the artificial beings could ever rise over their designers, respectively their creators, but the time of their lives is limited to 300 years of devoted servitude to these. Nevertheless, they are entirely free and can in every way decide as to what responsibilities they undertake, exercise, or decline and, thus, whether they want to focus on a task or not. So they are in no way subject to compulsion by their creators. In the manner in which they are biologically created, they are incapable of performing sexual acts and also of reproducing themselves. Their... artificial-bioorganic consciousness does not contain a creative spirit form, which would drive and animate this by its own energies. Animation is provided by the artificial brain, which is constructed in such a way that it can absorb and use the cosmic-electromagnetic life energies, so that the existence of life is guaranteed. It is this cosmic energy, by which the artificial life forms are animated and also made alive. All this, however, couldn't be recognized by all the doctors, surgeons, and pathologists, etc. in the American secret stations, where the crashed android beings were taken. But how could they, since their knowledge relating to this wasn't in place yet? In fact, it will still take many centuries and even several millennia before the terrestrial scientists arrive at the possibility of creating such beings as the bioorganic androids. 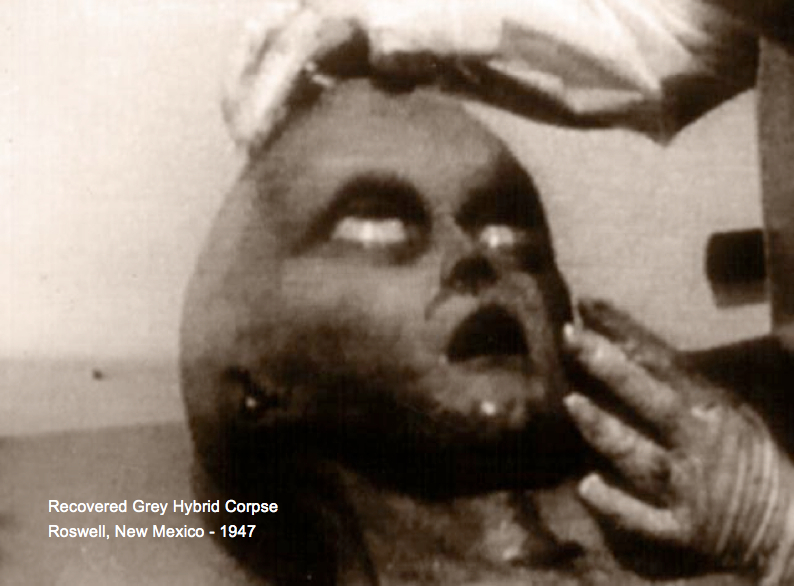 Therefore, these beings will remain an unsolvable mystery to them for a very long time, as it is also the case for them with regard to the crashed beings in Roswell. The complex information given by Quetzal concerning the bioorganic androids of the Reticulum people includes specific details of their collective telepathic communication and animation by 'cosmic electromagnetic life-energies' that indirectly refer to the resonant fourth-density environment of HHO plasma that is artificially created within their interstellar spacecraft. 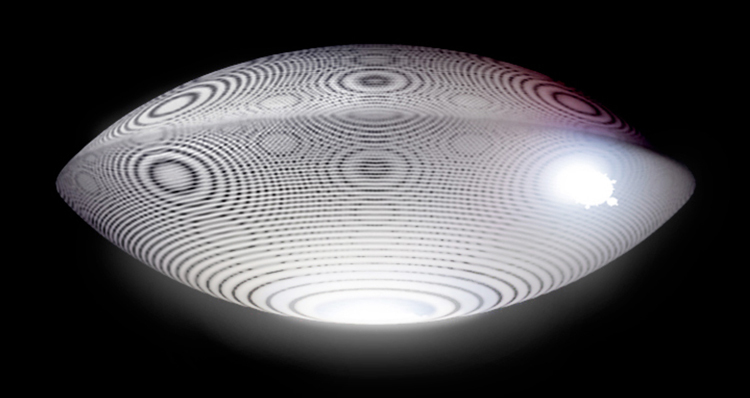 Brainwave and heartbeat synchronization engendered by resonant acoustic standing waves produced within the plasma ships induces collective telepathic communication, while animation of the artificial consciousness and bodies of the androids is accomplished by the nanopulsed bioelectric currents of HHO plasma. 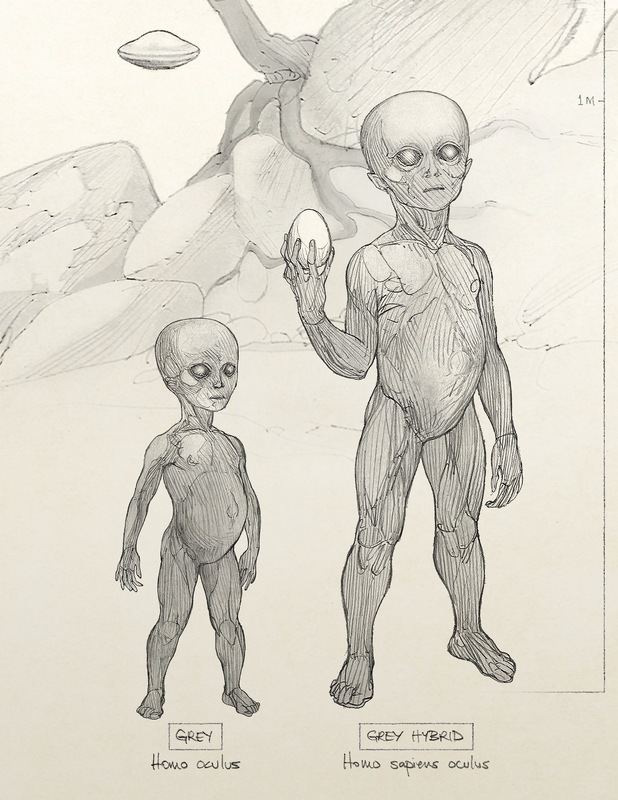 Further corroborating physical evidence for the fourth-density origin and biorhythmic animation of the Roswell androids has been documented by anthropology investigator Lloyd Pye --a small, unusual humanoid skull discovered 80 years ago in a cave in Mexico. 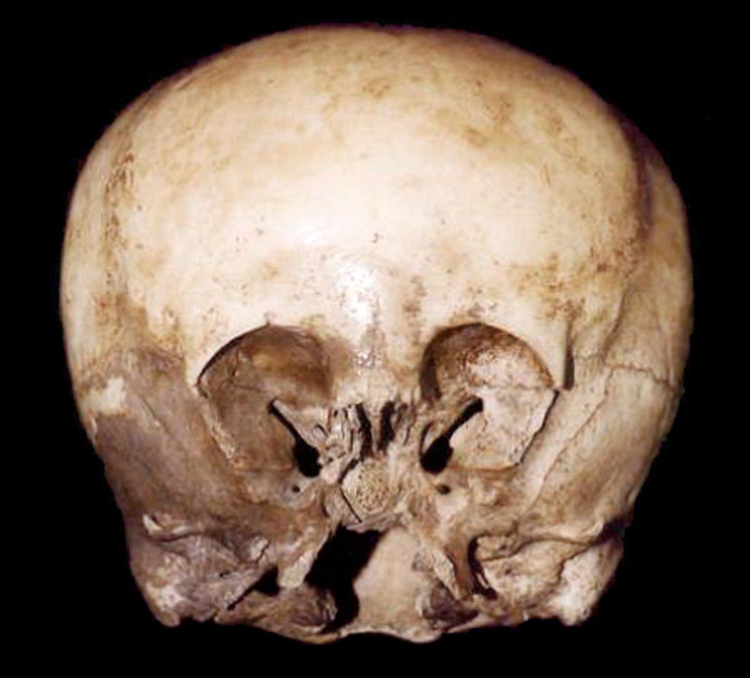 Known as the 'Starchild' skull (above, below), it displays a set of cranial features that closely resemble those of the Roswell humanoid, with extremely large ocular cavities and an expansive, round brain vault with a very broad, flat occipital region. 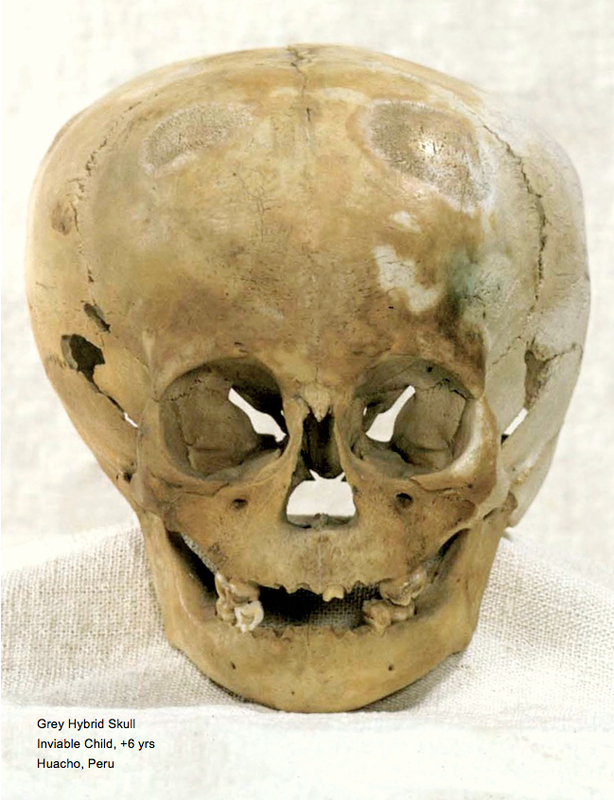 DNA testing of the Starchild skull has revealed segments of unique genetic material, and bone density analyses show major deviations from average human skulls, confirming the skull's extraterrestrial origin. 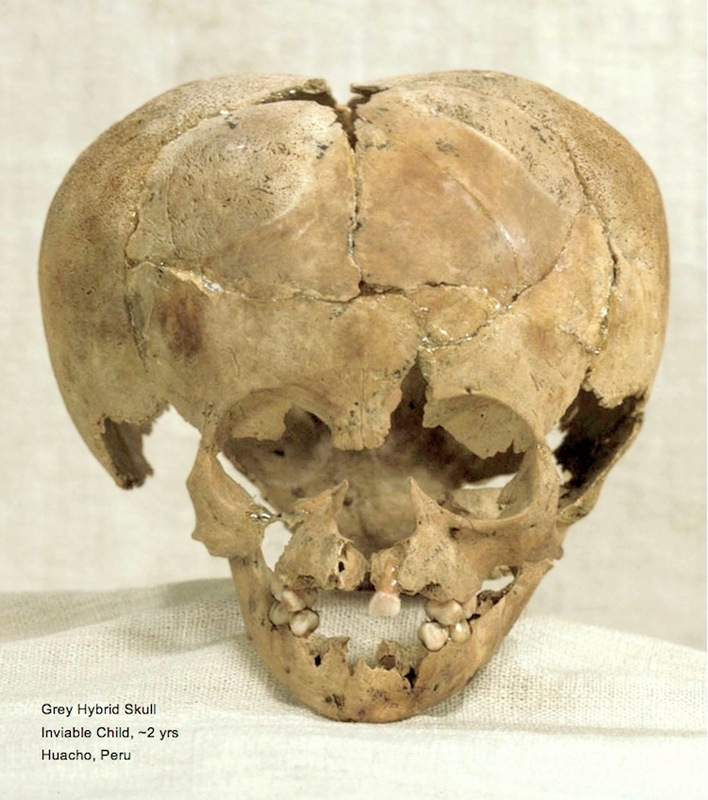 The Starchild skull is thought to be 900 years old, according to radiocarbon dating tests. Further analysis revealed the bone is twice as hard yet half as thick as the skull bones of an Earthly human being, with a density similar to tooth enamel. The unusual braincase presents a volume of 1600 cubic centimeters (cc), allowing for a brain mass that is 200cc greater than the average human brain. DNA testing has identified unique portions of genetic material that correspond to no known species. Microscopy studies of bone samples taken from this unusual skull provide the most significant evidence of advanced artificial bioengineering. 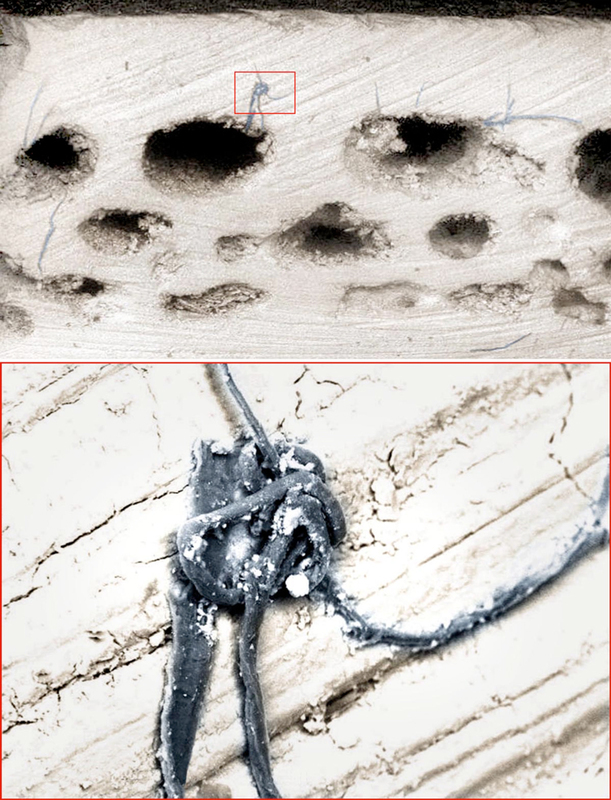 Cross-sections of the bone revealed the presence of metallic nanowires running through the many cavities crisscrossing its structure, known as cancellous holes (inset, below), that were not cut by the high-speed stainless steel rotary saw. Spectroscopic analysis of the nanowires has yet to be undertaken to determine the elemental composition of the metal. The enhanced electrical conductivity of metal nanowires grown within the artificially modified skull distributes the nanopulsed electrical currents of the HHO plasma atmosphere maintained within the Reticulum spacecraft to sustain the artificial lifeforms as they undertake interplanetary excursions. Complex metal alloys synthesized for acoustic levitation using cosmic infrasound standing waves convert the strong electromagnetic fields of the ships' internal HHO plasma chambers into reemitted visible light from the external surfaces, tuned as desired for various aerial displays or using infrared radiations outside of the visible spectrum of the vast majority of terrestrial humans beings. The enigmatic experiences reported by hundreds of thousands of eyewitnesses of extraterrestrial spacecraft transiting Earth's skies are now explicable in scientific terms, as nonlinear effects of quantum resonance. According to the weak form of Einstein's general relativity equivalence principle, the gravitational and inertial masses are equivalent... [To the contrary,] we have shown that the gravitational mass and the inertial mass are correlated by an adimensional factor, which depends on the incident radiation upon the particle. It was shown that only in the absence of electromagnetic radiation this factor becomes equal to 1 and that... it can be reduced, nullified or made negative by means of extra-low frequency (ELF) radiation. We have studied the possibility to control the gravity on luminescent materials and have concluded that electroluminescent materials with high refractive indices are a new and efficient solution for gravity control technology. "Workings of 30 resonances, female and male, 30 resonances whereby approaching for the highest." The New Mexico I-beam text directly confirms the Sanskrit origin of the pyramids and 'UFO' phenomena. 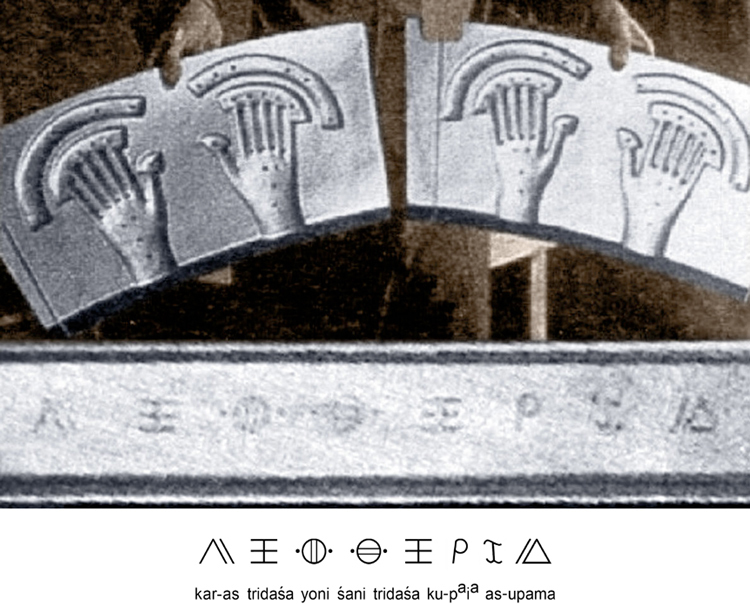 Four very unusual removable metal panels were also documented among the pieces of Roswell crash wreckage, formed with what appear to be inset hand consoles for conjoined control of the plasma ship. One of the panels was damaged. Like portable biocomputers for each crewmember of the ship, each panel is individually tuned to the biorhythmic signature of each pilot, precluding use by others. The panels' cast metal forms accommodate two small, six-fingered hands, with nodal sensors distributed at geometric points on the contact consoles and along a radial groove extending just beyond the span of the fingers. The configuration of the consoles exactly match the anatomy of the Roswell autopsy documentary video leaked anonymously to Ray Santilli and published in May of 1995, corroborating their close association and authenticity despite many ridiculous claims repeated ad nauseum by mass media outlets. 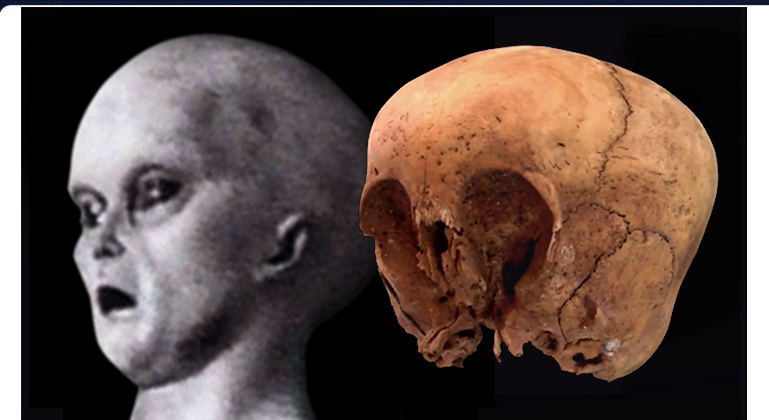 The Starchild grey hybrid skull recovered from a Mexican cave is the only known specimen to present the anomalous metal nanofibers running through the bones' cancellous structures, yet other specimens from the same grey/human hybrid species have been documented. 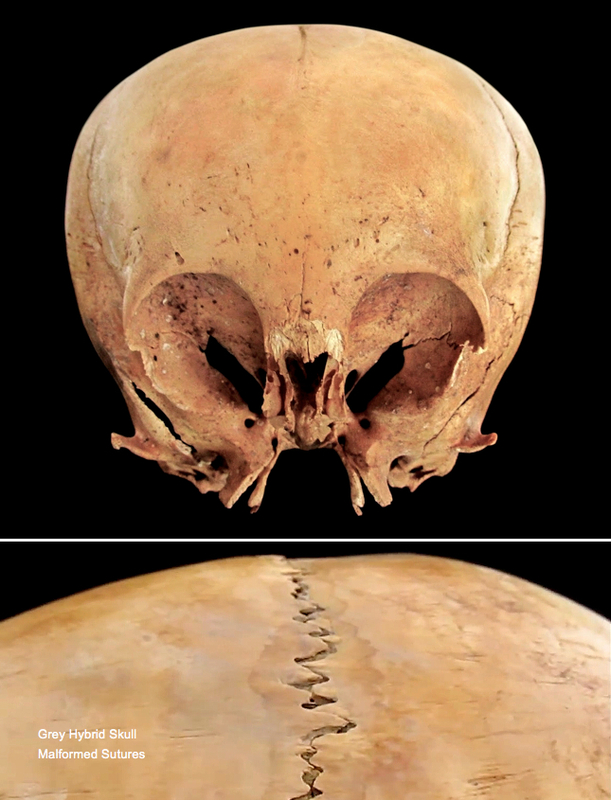 Video and photographic images of another similarly fragmentary skull have recently emerged in South America --among the remains of giants. 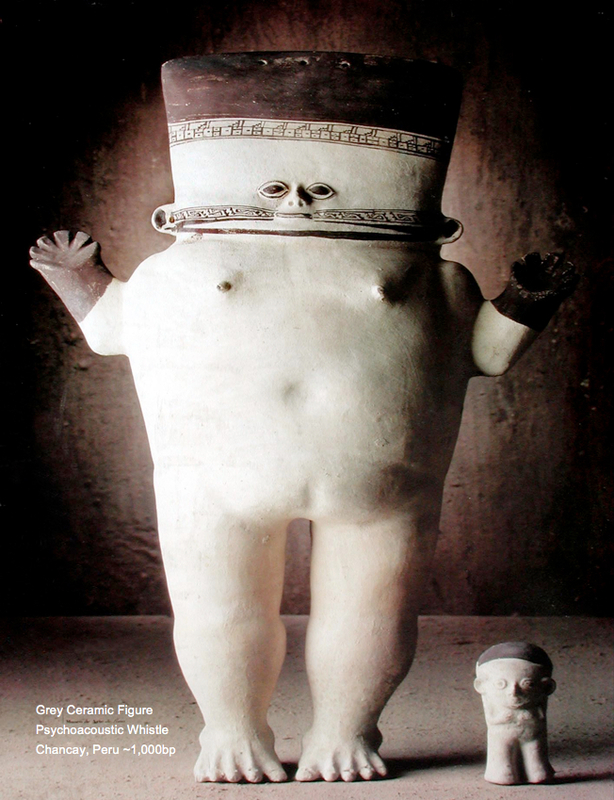 One of these unusual specimens emerged from the sandy desert soils of the ancient necropolis preserved in present-day Paracas, Peru (above, below). Dating to ~2,300bp, the small, bulbous skull is missing the entire mandible, which appears to have been detached from the cranium at the same joints as the Mexican cave specimen. 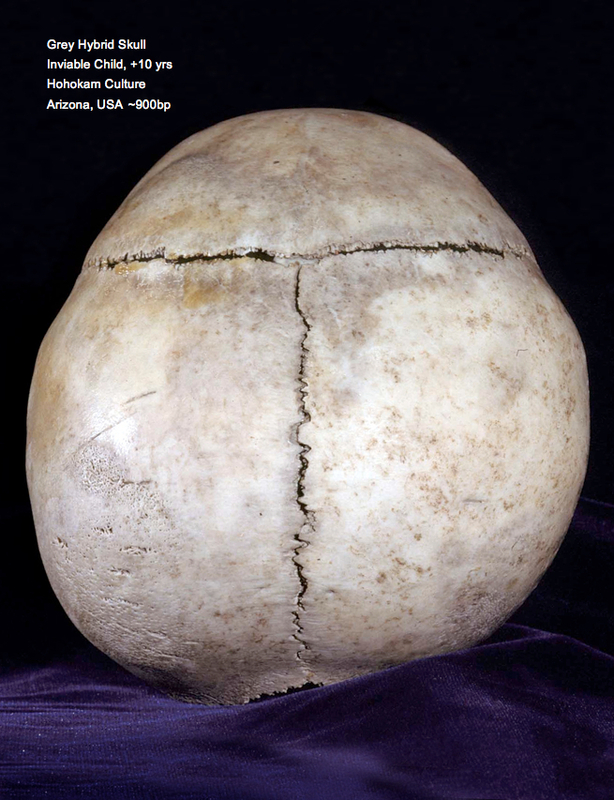 The freshness of the fractures on the ocular orbits and nasal bridge are evident from the bright color of the fractured bone that does not correspond to darkened patinas on the skull's surfaces. General public disregard for ancient burial sites and associated human remains in Peru and most other South American countries is the direct result of corrupt government policies that purposefully neglect or deny funding and critical protection for ancient sacred sites for well established political motives. 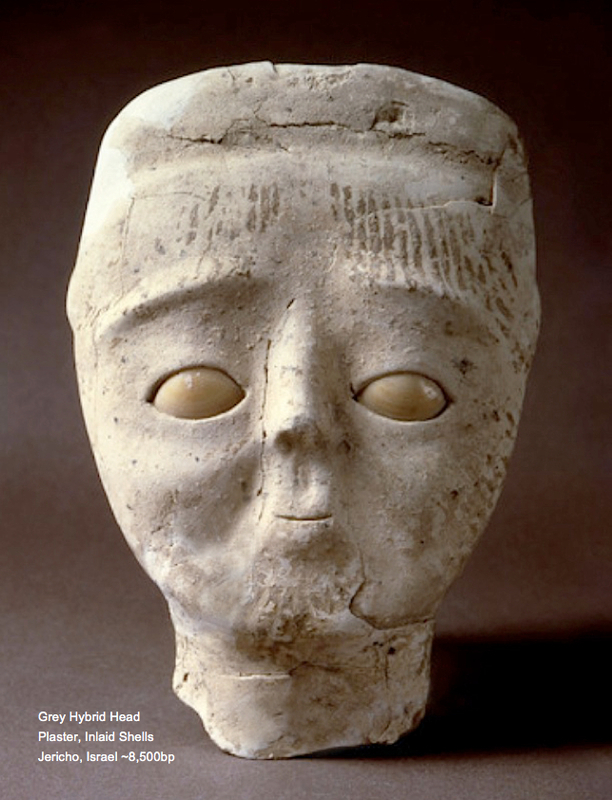 The completely hypocritical government policy of meticulously cleaning and documenting archeological finds deemed 'acceptable', while completely disregarding or destroying 'unacceptable' finds is conducted according to a secretive agenda obfuscating the reality of exoplanetary mass hybridization of humanity. Many fragmented and malformed grey hybrid skulls excavated in Huacho, Peru are adequately restored to provide a clear view of the mandibular and zygomatic morphology absent from the other known specimens. Slide images were recently made available online as part of a comprehensive table of skeletal pathologies of modern and ancient specimens by Dr. Donald J. Ortner of the Smithsonian Institute. 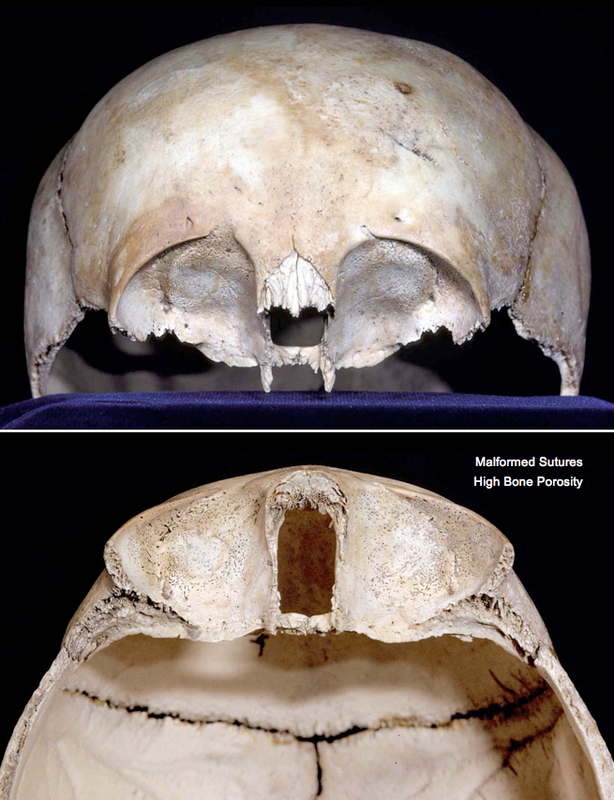 A remarkable example of a grey hybrid skull over 6 years in age displays excessive bone porosity (above, below). 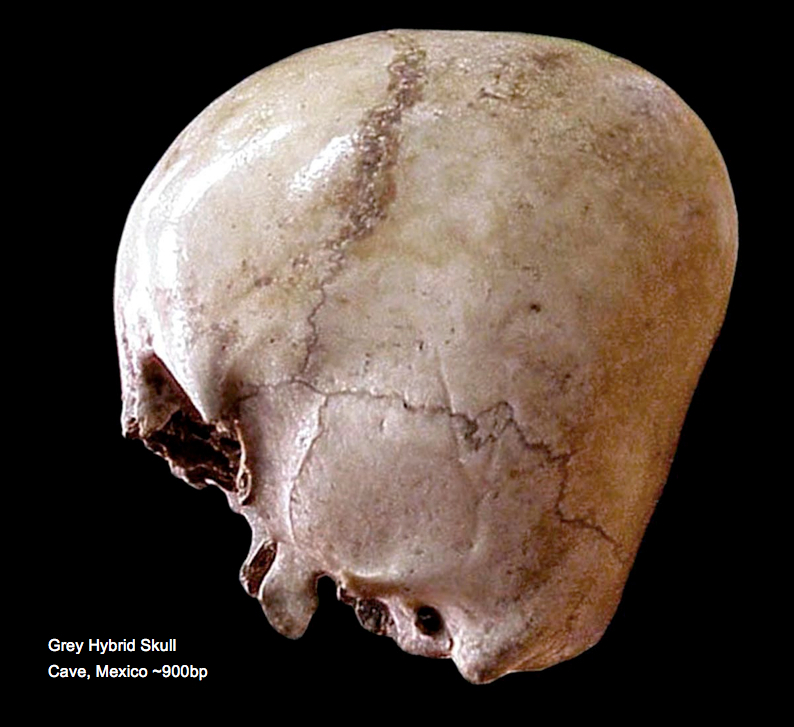 Another malformed grey hybrid skull of approximately 2 years in age displays the same bone porosity anomalies (below). 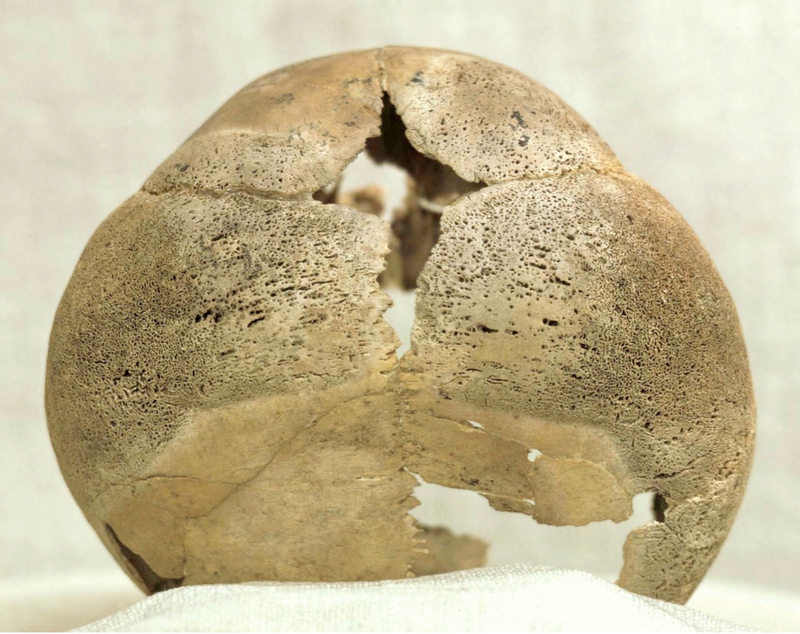 During his research, Dr. Ortner labelled these unusal malformed skulls as resulting from some unknown "metabollic deficieny??" that he could not identify without complete genetic analyses. In fact, these bone quality anomalies are not related to a metabolic deficiency such as scurvy, but appear as the likely result of a failed interspecies hybridization between humans and greys. All of the Huacho grey hybrids died at very young ages due to malformation of the sutures binding the cranial bones together, as well as having been significantly weakened by the extreme porosity of the bone itself, implicating inviability. High-density bone samples taken from the Mexican cave grey hybrid specimen were characterized as being enamel-like, with a hardness that significantly exceeded that of normal human bone, whereas the Huacho grey hybrids display the opposite tendency. 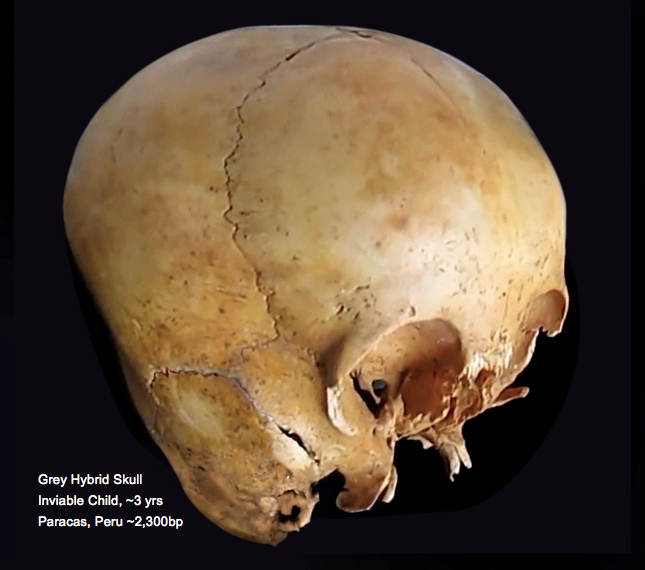 While the cranial morphologies are exactly consistent, it is abundantly clear that the Huacho skulls belong to a small breeding population of grey hybrids that had degenerated to the crucial point where the genetic lines could not survive due to skeletal deformation. 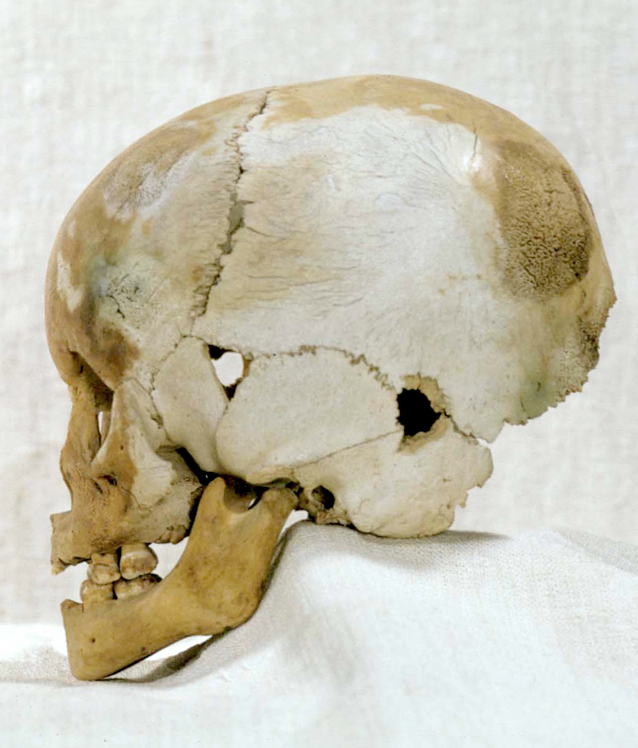 The youngest of the grey hybrid skull specimens documented in Dr. Ortner's archive display the most significant areas of bone degeneration that caused their premature deaths, whereas those individuals with less evidence of bone malformation appear only to have reached the age of pre-pubescence. Genetic sequencing of these ancient Peruvian specimens with completely clarify the interspecies origin of these failed hybrids lineages once present among the ruling classes of Andean societies for thousands of years. Such advanced exoplanetary genetic manipulations of ancient human populations all over the world requires an extreme level of technological sophistication that cannot be reconciled by pathologists. Dr. Ortner was murdered by government agents on April 29, 2012 for participation in forensic analysis of the 'Mush Hole' excavations of slain indigenous children in Brantford, Ontario --victims of the nationwide Residential School genocide in Canada now widely exposed by Kevin Annett of the International Tribunal into Crimes of Church and State (ITCCS). The Smithsonian Institute has also been exposed as the primary governmental body responsible for confiscation and cover-up of abundant archeological remains possessing non-human nuDNA sequence revealing the enigma of exoplanetary mass hybridization. The basic right of human beings to study our own heritage and the origins of our own cultural practices has been and continues to be blatantly violated by all governments of the world, who collectively prevent the application of DNA technologies and supercomputers to the open question of human origins on planet Earth. The slow, delayed creep of technological progress is revealing what has been cleverly hidden. 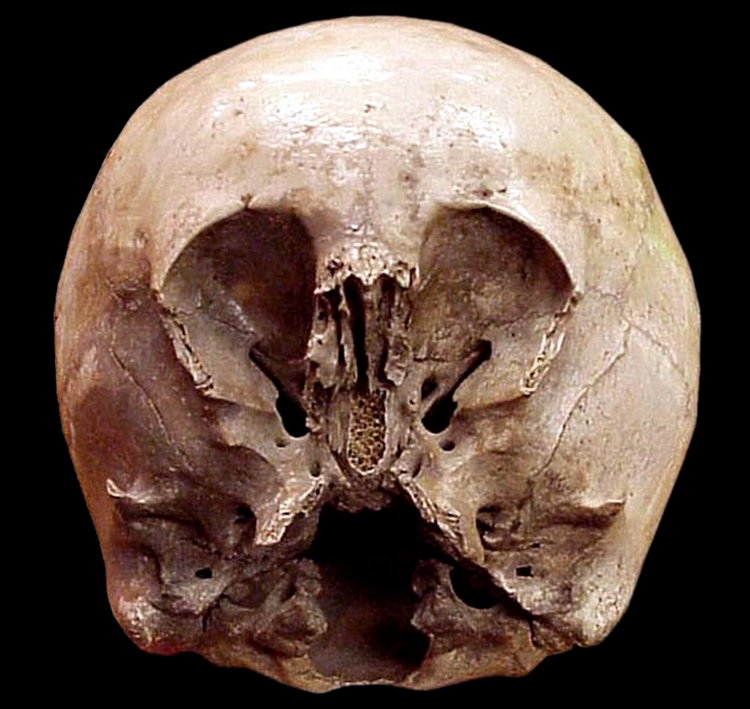 Genetic studies of the grey hybrid skull from Mexico reveal the mosaic pattern indicating the use of three-parent in vitro fertilization techniques first accomplished by medical doctors in human clinical trials in 1996. In another remarkable, newly discovered process of epigenetic reprogramming, skin cells have been fully converted into stem cells, and subsequently into sperm and egg cells viable for in vitro fertilization. These new techniques inform an understanding of the hemispherical scars often found on the legs of extraterrestrial abductees, commonly called 'scoop marks'. Tissue samples are being taken for conversion into gametes. The veracity of detailed UFO abductee reports concerning the mass hybridization dynamic being described by an overwhelming majority of its human victims is directly affirmed by the astonishing genetic diversity of humanity on Earth. Artificial creation of grey/human hybrid lines by the giant reptilian humanoids facilitates exoplanetary gene flow into the human domain that cannot otherwise occur in a natural manner. Beyond diminished size characteristics commonly observed of modern human populations expressing backcrossed dwarf genetic traits, rare expression of recessive genes for postaxial polydactyly does occur, influencing the unusual growth of an extra finger on the outer side of the hand. 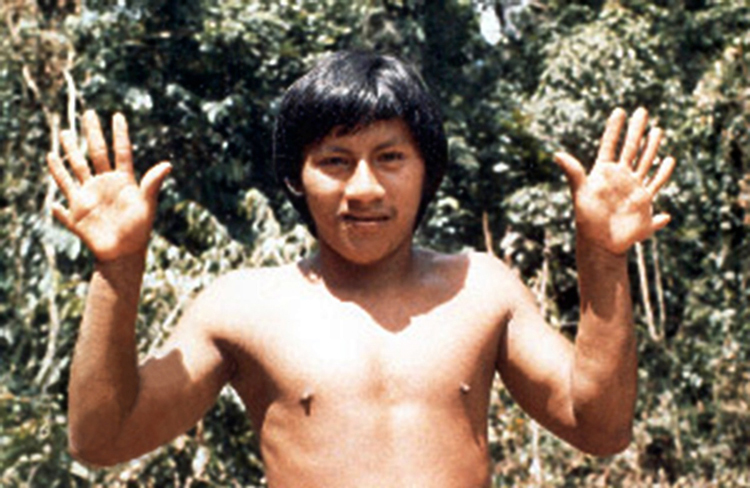 This remnant genetic feature is most prevalent among indigenous rainforest cultures of the Amazon, as seen among the Shuar people of Peru (above). Ancient cultural traditions in these regions are not entirely unaware of this offworld heritage. Appropriate species names for the greys and their hybrids would be Homo oculus and Homo sapiens oculus. 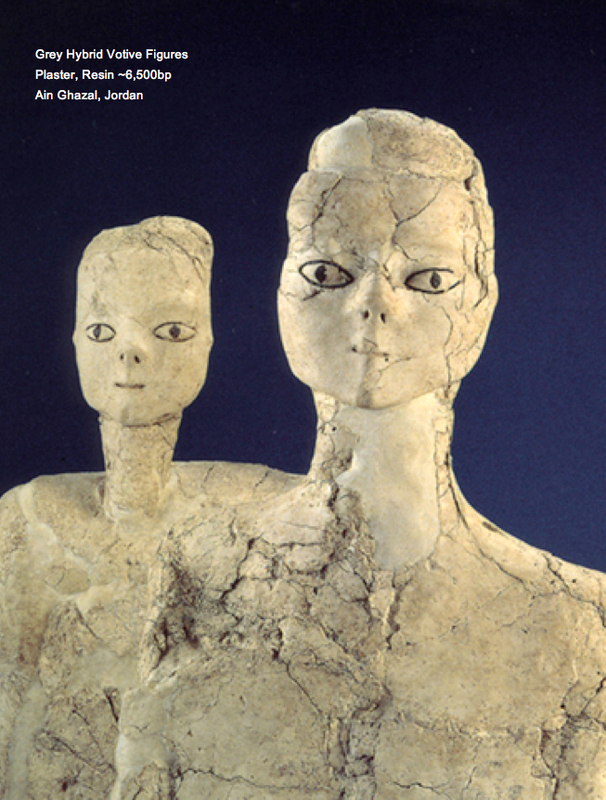 Genetic sequencing of both the extraterrestrial greys and their human hybrid counterparts will fully elucidate the quotient of genetic heritage disseminated among modern and ancient human haplogroups, offering the first comprehensive details concerning the exoplanetary aspect of human genomic diversification on Earth.